Gonzalo Duran was born in Mexico, emigrated to the U.S. as a child, and grew up in East L.A. He attended Otis Art Institute and The Chouinard Art School. He has been called the Marc Chagall of the North and Central Americas. His brilliant, sometimes startling palette complements his unbounded imagination. 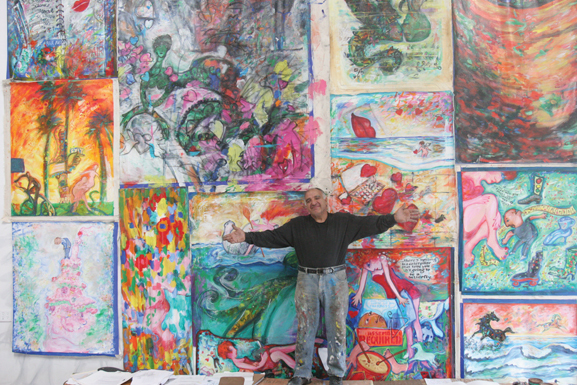 He runs the Panzalo Art Studio with his wife, artist Cheri Pann, from their Venice, California home. Most of the subject matter on the guitars is described by Gonzalo as “intimate details of our lives together, Cheri and I.” Duran continues to work with traditional canvases as well, which are larger versions of the subject matter painted on the guitar series. “They’re a bit bolder, and there’s more room to work with, of course, so I can express many more ideas,” he explains.